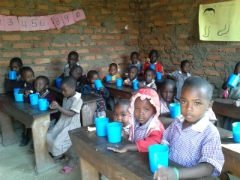 Marumba Christian School is a community school located in the village of Marumba which is three kilometres from the town of Rukungiri in Western Uganda. Marumba is a trading centre of about 100 people who live in very poor circumstances. Along with the poverty evident in the area there are ongoing challenges with the HIV-AIDS epidemic, single parent families, and alcoholism. The idea to establish a Christian school was born on 30th June 2011. It was the vision of three men, Reuben Tumuheirwe, Justus Matsiko and James Muhabuzi, who have a heart of compassion for disadvantaged children, especially those from rural areas. 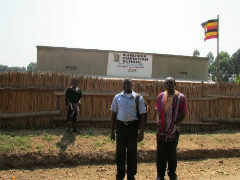 Bright Hope World has been partnering with Reuben and Justus in Rukungiri for a considerable time now. Marumba Christian School has sprung out of that involvement and is a testimony to their commitment to this community. The school has been established to help less privileged children attain a better quality of education and to be imparted with spiritual values. This school hopes to meet the needs of the people in this area providing them with an opportunity to gain a good education, a chance to move out from poverty and to have a brighter hope for the future. Bright Hope World has been partnering with some young men in Rukungiri in the south west of Uganda towards the DRC/Rwanda border area for a number of years. In 2008 we sent three of them from that area to GLO Zambia for training. Two of those men, Reuben Tumuheirwe and Justus Matsiko, are now based in the town of Rukungiri and are involved in church planting there. As part of this, in 2012 we commenced a cattle development partnership with them to both support them and develop the community (see UGA07). The initial focus changed when it became apparent to Justus and Reuben that many children in this community are not able to afford to go to school. This is why the school came about. Initially it was in rented premises which rapidly became inadequate for the growth in pupil numbers. There were also ongoing issues with the landlord. So when the opportunity came to purchase the new school land and buildings which were in reasonable condition, on a site very close to the existing school, it was an opportunity too good for Reuben and Justus to miss. 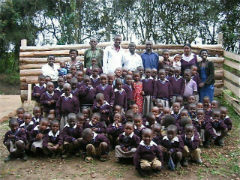 Because many parents cannot afford to pay enough to make the school fully viable Bright Hope World needs to support it. The school has considerable financial pressures and at times has experienced difficulties in paying the salaries and meeting operating costs. 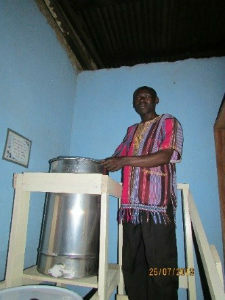 Bright Hope World have been assisting in funding the school on a reducing basis. Reuben and Justus are also focused on various strategies which will help the community to develop income sources and sustainability. However this is likely to take a few years to reach fruition. The original intention of the cow project was to assist as many of the families as possible with cows as that project developed so that the parents could then generate enough income to pay the school fees. After extensive discussion it has become clear that this is not realistic or appropriate in this area. The teachers have, however, initiated a simple form of micro-loan programme among themselves and there are other potential opportunities in this community. The primary beneficiaries of this partnership are the more than 100 children at the school who, in addition to receiving a quality education, will also be taught Christian values. This will also have a flow-on effect to the whole community. The teachers at the school, previously working for no pay and struggling to live, will also now be paid. Schools all over the world provide a focus for a local community and Marumba is no different. The children are being supported to receive a good education, the leadership is outward focused and concerned not just with the children but also with the local community and the problems which they face. The school also provides work for some of the local people and it is great that the teachers are now being regularly paid and at a reasonable rate. Having a school also provides an incentive for other young people to become school teachers. Reuben and Justus have a real passion for the community and a real love of God, and their willingness to sacrifice to make things happen is impressive. It is almost always true that the quality of a partnership is dependent on the quality of the people involved. 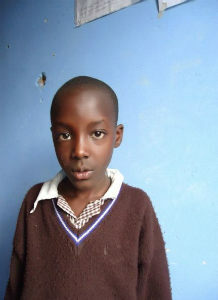 Justus is married to Grace and lives in Rukungiri town. They have one child. When he was 5 he lost both his parents and was then raised by his grandmother for a short time before being taken to another family. Justus is involved extensively with the school. Although he is not employed by the school he is there most days. He is also extensively involved in church activities like preaching and teaching the Bible using the expertise he gained from his training at GLO Zambia. He has led various gospel outreaches and has experience in leading and discipling young people. 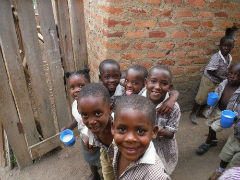 Bright Hope World is committed to journeying with Reuben and Justus and the school and cow project. Not only are they able to articulate a clear vision for what they want to see happen, they are continuing to step out in faith and pursue the vision with active steps. They are also looking to expand the cow programme to enable it to at least partially fund the school into the future. 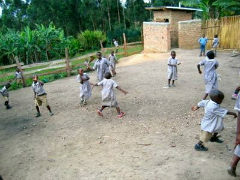 Rona Asiimwe started in primary two. She was born in 2005. Her father died of HIV/AIDS and she lives with her mother. Unfortunately, Rona and her mother are both HIV positive. Rona’s health has been poor and she continues to suffer from poor nutrition at home and because of the medication she is on. Rona asked her mother why she needed to take medication and her mother has told her of her status. Rona has significant needs and Justus is aware that she struggles to have hope for the future. Faith was 8 years old when the photo was taken and studies at Marumba Christian School. Her mother left her husband after receiving news that he was HIV positive. Shortly after their divorce, the husband died. Faith’s mother went back to her father’s house where she stays with his old mother who cannot help them at all because she is too old. 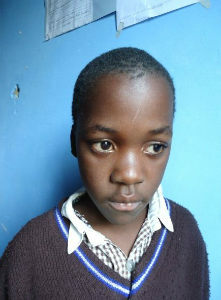 Faith’s mother struggles to survive and keep her daughter in good health as they are all sick. One time Faith was too sick and her mother came to school requesting Justus to pray for her daughter thinking that she was demon possessed. Justus prayed with them and advised them to go for a blood check-up. They all tested positive and were really upset by it. It was very sad on that day to get such bad news. Owen was 8 years old, when this photo was taken. 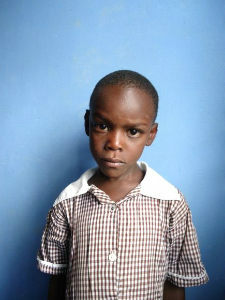 His mother has died and he lives with his father who is always down with malaria and tuberculosis due to a weak immune system because of HIV/AIDS. They do not have enough food to eat, and his dad’s life keeps on deteriorating every day. Owen is too young and sick and at the same time worried that he will not know what to do when his father dies.